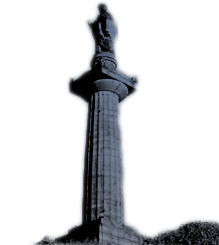 Unlike the subjects of many of our profiles, who were Glasgow born and bred, Robert Cunningham only resided in Glasgow for a few years yet he and many members of his family are buried in the Glasgow Necropolis. 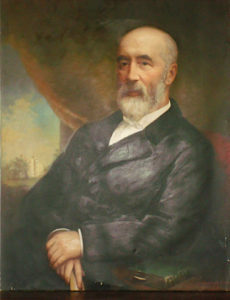 Cunningham was born at Stranraer on 17 August 1799 the eldest of seven known children of Andrew Cunningham, merchant in Stranraer and Jane McBride, his wife. [Family Search] Andrew Cunningham seems to have traded around the Irish Sea and the family spent some time on the Isle of Man (1810-1816) where the three youngest children were born. Andrew drowned on a voyage between Liverpool and the Isle of Man around 1818/9 when his eldest son was 19. [Obituary, F C] It is not known whether Andrew and his family had returned to Stranraer but by then Robert certainly had left home and was studying at Edinburgh University. 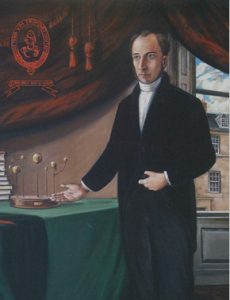 In the east of Scotland Cunningham was beginning to gain a reputation as a forward thinking educator and in 1826 he was ‘poached’ by George Watson’s College, Edinburgh for the position of House Governor. October 1832 was a momentous month for him both professionally and personally. On 1st October the doors of the Edinburgh Institution opened for the first time at 59 George Street with Cunningham as the founding headmaster and at the end of the month he married Elizabeth Jeffrey. In July 1832 Cunningham had tendered his resignation to the board of Governors of George Watsons’ Hospital with effect from 1st October 1832. [For what follows see the documents collected by David McLeish in 1999 for Cunningham’s bicentenary] By August 1832 he was soliciting testimonials from suitable gentlemen in preparation for opening a school to be known as the Edinburgh Institution in which he intended to teach a more broadly based curriculum than the classical one found in most schools at that time. More emphasis was to be placed on modern languages and literature, the sciences and especially mathematics. The school roll grew quickly necessitating a move to larger premises in Hill Street then to Queen Street and finally to Melville Street in 1920. It did not adopt the name of Melville College until 1936 and in 1972 it merged with Daniel Stewart’s College to form Stewart’s Melville College. Robert Cunningham’s name has never been associated with the school he founded in the same way that Daniel Stewart’s has with the result that his name has slipped from general public consciousness. Shortly after the proclamation of their banns for the third and last time on 28th October 1832 Robert Cunningham of 16 Hart Street and Miss Elizabeth Jeffrey of York Place married in Edinburgh. Some sources refer to Elizabeth as a widow but the evidence of her marriage banns and death certificate show she was not. She was the eldest of at least seven children of John Armstrong Jeffrey (1768-1822) of Allerbeck and Baldarroch, writer in Edinburgh and Elizabeth Catherine McConnell (1785-1856). By early 1837 Cunningham decided to leave the Edinburgh Institution and on 10th March he wrote to the parents of his pupils notifying them of his decision to resign at Whitsunday (14th May). He received many letters of thanks testifying to his talents as a teacher, expressing sadness at his departure and expressing warm wishes for his future health and happiness. Many of the letters allude to the fact that his health had been affected by his work and that this was the reason for his resignation. At the beginning of May, a few days before the Cunninghams left Edinburgh, nearly two hundred pupils of the Edinburgh Institution presented their headmaster with a gold watch and chain as reported in the Caledonian Mercury of 6th May 1837. The Cunninghams had finally reached Glasgow but only stayed for a couple of years. According to the Glasgow Post Office directories of the period their first address was at 207 St George’s Road before they moved to 20 Buccleuch Street. However at the time of the 1841 census (6th June) Elizabeth with her sons John and Andrew are found in the household of Duncan Cowan, a retired merchant, at Carlton Place, South Leith, Midlothian. It is not so easy to identify Robert in the census but the only likely candidate seems to be Robert Cunningham, teacher, living at North Woodside Road, Barony, Lanarkshire. There are nine people living at that address and the census is not specific enough to indicate whether Robert is living there as a lodger or is living in a separate house. The family’s time in Glasgow can not have been entirely happy. 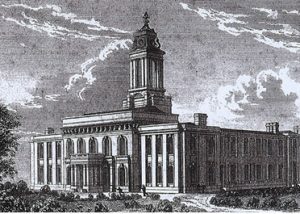 The buildings of the Normal Seminary had not been completed when Robert arrived although it was fulfilling its business of teaching children and training teachers; the Glasgow Educational Society was burdened by debt and Robert’s salary fell into arrears; two of their children died, hence the need to purchase a lair in the Glasgow Necropolis (in Compartment Lambda lair number 195). Sometime in 1840 Elizabeth gave birth to a daughter who must have died shortly after birth as she is not named on the gravestone and her precise dates of birth and death are not given. The following year on 18th February, Robert jnr., who had already travelled twice across the Atlantic died aged 7. 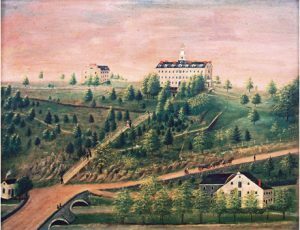 At some point in the summer of 1841 (JMM Cunningham says it was during a holiday at Port Bannatyne near Rothesay), Cunningham decided to leave the Seminary and set up his own school. 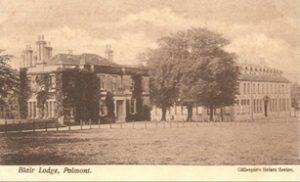 He initially leased Polmont House but quickly outgrew it and moved to the adjacent Blairlodge House in 1843. Newspaper advertisements give some flavour of the school he had established. One in the Glasgow Herald of 27th December 1844 states that there were at that point 48 pupils and from 1st March 1845 there would be space to accommodate 6 more. Applicants must be less than 12 years of age. The school (Academy as it is described in the advert) is non-denominational “the aim of the religious instruction [being] to make Bible Christians, without reference to denominational peculiarities”. On 17th August 1846 there is a report in the Glasgow Herald of the end of term examinations of the pupils held on 31st July, before they broke up on 1st August. Not only were all the boys examined between 9am and 4pm but there immediately followed the prize giving. One of the prize winners listed was Cunningham’s own son John George (dux of the 3rd Latin class, dux of 2nd French class, 3rd place in 3rd History class). His other son Andrew would have been too young at this point to enter the school. On a personal note it was during this period at Polmont House and Blairlodge that Cunninham’s three surviving daughters were born. Ellenor his eldest daughter (b. 1841) died at 10 months old and was buried in the Necropolis in August 1842 to be followed two years later by her grandmother Janet Macbride or Cunninham who died in July 1844 at Blairlodge at the age of 67. Elizabeth the middle daughter (b. 1844) died unmarried in 1920 and is also buried in the Necropolis. Agnes the youngest daughter (b. 1846) married William Armstrong and died in 1896. 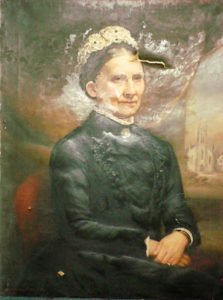 Elizabeth Jeffrey, Mrs Robert Cunningham, in old age. The church behind her left shoulder is thought to be Rutherglen Free Church built in 1850 but it is not known what connection she had with this church. To all intents and purposes Cunningham seems to have retired after leaving Blairlodge although he lived for more than thirty years. He moved to Edinburgh where he served as an elder in Lady Glenorchy’s Free Church and undertook various activities relating to Free Church matters. One of these entailed a five month visit of inspection in 1856 to schools in Lebanon and Syria before the Colonial Committee of the Free Church took formal charge of them. Reverend Robert Cunningham, in old age. The building behind his right shoulder is North West Castle, Stranraer. In 1859 he returned to his roots when he bought North West Castle, Stranraer, the former home of Admiral Sir John Ross the Arctic explorer. At Stranraer Cunningham settled into the social life of the town – he gave public lectures, subscribed to the new Girvan and Portpatrick Junction Railway and took part in the charitable life of the town. He died at North West Castle on 10th August 1883 and was brought to Glasgow for burial alongside his mother and children. His wife, Elizabeth Jeffrey, survived him by ten years and their eldest daughter, also Elizabeth Jeffrey, was buried beside her parents in 1920.